Once again I'm kind of burnt out. Not surprising as I'm ten posts up on the previous year, again. And I managed to take an entire month off too. I'm still holding my slightly more than three posts per week average for the second year in a row. The Central MA gaming group continued to meet this year. We managed six games together, including a big one at PAX East. We also added a new player and may be adding another two next year. 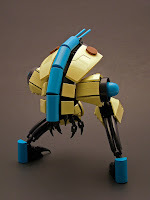 I managed 82 reviews this year; 1 book, 2 model, 2 aftermarket manufacturer, 5 Mega Bloks, 9 Kre-O, and 63 Lego. That comes out to an average of 6.8 per month. Which is an increase of 0.5 reviews per month. I'm now north of 350K views, which is roughly another 90K views since last year. Thank you to everyone for that. My Flickr stream is over 1 million views which I must thank everyone for as well. I got to attend PAX East 2015, meet a great group of MoF0s, and play an awesome game. I'm really looking forward to 2016 even though everything that was planned with Dark Clouds Blogs has been postponed until 2017. Since I saw Star Wars: The Force Awakens over the Christmas break I figured I'd review one of the new sets from the movie. for $3.99 which gives us a $0.06 Price per Piece. 1x1 Round Bricks too. A few Cheese Slopes and Jumpers as well. 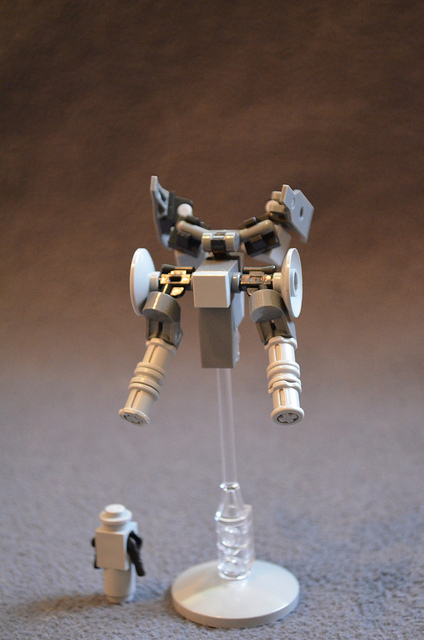 (double guns) 1G (extra legs) 2W. Score: +20 (A+). A good score, but I'm not feeling this one. Merry Christmas -- for those of you that celebrate it --here are a few "presents". 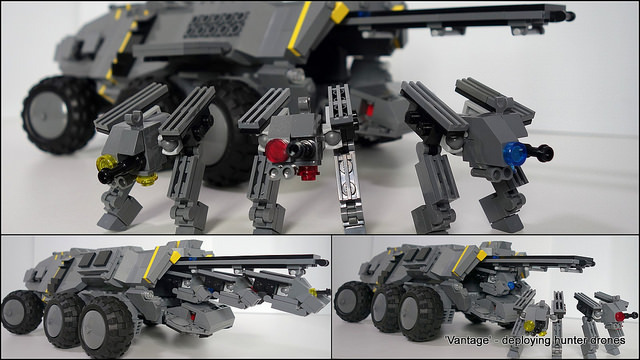 'Vantage' Medium Armored Transport - deploying drones by pine lego. tall -- and a honkin' piece of terrain that carries them around. be a little big, but it looks interesting. comes out a little large so you'll have to click through the link. It also has a surprise. 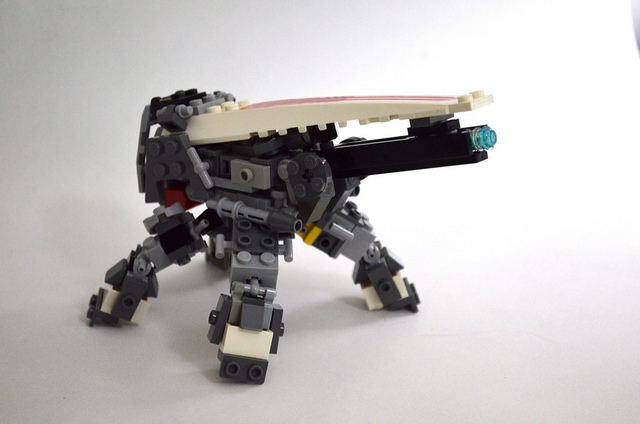 'Reaper' Drone by Malicious Cheesecake. Made specifically for MFZ. parts choices are fantastic. This one's a learning opportunity. This was a promo polybag for Toys'R'Us in December. Bag. It's currently retailing for $4.99 at TRU, despite the "NOT FOR SALE" markings on the back of the package, which gives us a $0.19 Price per Piece. Parts. As you can see there's not a hell of a lot here. Smash!) 1B (4 Wheelin'!) 1Gd8/2W. Score: -15 (C). Awful. The stickers may be the only reason to buy this set -- and, yes, they count as a part. Someone on the Facebook Group was interested in the minifigs for this line, so I grabbed the only affordable "Ultimates" set. Box. MSRP was $9.95 for a $0.10 Price per Piece. Parts 1. I see a new Slope piece in the top right corner, a new Minifig Shield below that, three new Trans-Color Shield Inserts in the lower left, plus one of the new Multi-Stud Shooters in the upper left. Parts 2. The Minifig Visor was in the second parts bag which I find weird. The new crest is made from a new rubbery material. There are more of those new Pyramid Slopes in this set along with some new Trans-Orange Bar Claws. Everything else is pretty standard. Build 1. Completely ripped off from darksynatx's recent SSC. Build 2. Or you could just go with the minifig. Score: +15 (A). Better, but apart from the new pieces I don't think there's much to recommend this set. I wasn't planning on doing a review for today but a local store put several Nexo Knights sets out on the shelf early. Box. MSRP is $9.99 for a $0.11 Price per Piece. Parts 1. These were loose in the box. Parts 2. We have the bulk pieces in this lot. That 2x2 Plate w/Two Descending Pins is really interesting. I like the Trans-Orange bits too. Parts 3. The smaller bits in this lot. In the lower right you see the 1x1 Pyramid Slopes people have been talking about since news of these sets broke. Nothing else new, but we do have a decent selection of useful parts. Build. A very clunky IO Frigate. 2Ra/2B/1G/2W. Score: +5 (B+). Not that great. Hopefully the rest of the line scores higher. My friend Rusty Panama couldn't make the game last Sunday so I visited him last night and we ran through a demo game so he could get more acquainted with the rules. Me (2 Frames & 8 Systems) = (5 Points per Asset) * (2 assets) = 10 points. Rusty Panama (2 Frames & 8 Systems) = (5 Points per Asset) * (2 assets) = 10 points. Starting out with the same amount of Frames and Systems makes the start of a demo game even, which is good for a person who has never played the game before and hasn't been exposed to the asymmetrical nature of starting points in Mobile Frame Zero. Also, putting a single Station in the middle of the board gives an obvious object or point in space to fight over which is also good for beginners. This is what the table looked like at the start of the game. My forces are on the right side of the board. Events of Turn 1 (DDC@7): Rusty's Brawler frame takes the Station. His Thumper frame hits my RB-91RF frame for 1 damage. My RB-91RF frame hits his Brawler frame for 2 damage. My RB-91H frame hits Rusty's Brawler for 1 damage. Events of Turn 2 (DDC@5): My RB-91H frame hits Rusty's Brawler for 1 damage. Events of Turn 3 (DDC@3): My RB-91H frame hits Rusty's Brawler for 1 damage. My RB-91RF frame hits his Brawler frame for 1 damage and finishes it off. Events of Turn 4 (DDC@1): I seize the Station. The Doomsday Clock is ticked down to zero. Sorry about the crappy pictures. I forgot my green felt and I should have rolled back that tablecloth. I set the clock to seven because a two turn game is just too short. Rusty made the smart choice to grab the Station right away and try to control the tempo of the game. His Brawler almost held on. Three turns of Hit, Spot, Hit is a long time to take damage. We both had SSRs and never used them. Whoops. I don't think anyone has posted a breakdown of a short game using Vincent's Demo Rules. I hope this helps anyone who is thinking of running a demo to introduce people to the game. It's getting close to Christmas and the sales are coming fast. Toys'R'Us is running a sale on several different product lines. 30% off on TMNT, Chima, Ultra Agents, Lego Movie, and Pirates has some interesting opportunities. Barnes & Noble is advertising some Hard To Find sets. Target is advertising a free Lego Minifig set when you buy any LEGO City, Ninjago or Super Heroes item $39.99 or greater. The gaming group I'm a part of usually takes November and December off due to all the holidays and general busyness of the season. But this past Sunday several members of the group had a clear moment in all our schedules. So we decided to get together, along with two newcomers, to have a game of MFZ: RA. Here are the results. Me (3 Frames & 11 Systems) = (7 Points per Asset) * (4 assets) = 28 points. Occam's Spork (4 Frames & 16 Systems) = (3 Points per Asset) * (5 assets) = 15 points. Tom (4 Frames & 16 Systems) = (3 Points per Asset) * (5 assets) = 15 points. Narbey (4 Frames & 16 Systems) = (3 Points per Asset) * (5 assets) = 15 points. Gusindor (4 Frames & 16 Systems) = (3 Points per Asset) * (5 assets) = 15 points. Gusindor was selected to be Primary Attacker by lowest dice roll. Here's how the table looked at the start of the game. My squad started out in the center of the table. Occam's Spork's squad controls the lower left corner. Tom's controls the upper left corner. Narbey's controls the upper right corner. Gusindor's controls the lower right corner. Events of Turn 1 (DDC@11): A fair amount of movement and jockeying for position occured. Gusindor did the most damage with his HtH specialist, dealing three hits to my HtH specialist. Events of Turn 2 (DDC@8): Narbey destroys one of Gusindor's Soldier frames. Occam's Spork seizes Gusindor's Station, then later in the turn does the Station Dance to avoid damage on the frame that took control. Events of Turn 3 (DDC@4): I seize Gusindor's Station away from Occam's Spork. Occam's Spork destroys that frame and takes back control of the Station. Gusindor destroys my Soldier frame. Events of Turn 4 (DDC@1): Occam's Spork kills one of Tom's HtH Specialist frames. Gusindor seizes my Station. Narbey destroys one of Gusindor's and one of Tom's frames with a single shot then seizes my Station. Narbey destroys another one of Gusindor's frames, aka "Shinkicker". Tom kills Narbey's frame that had taken my Station, allowing Gusindor's frame to recapture it. The Doomsday Clock is ticked down to zero. Final picture of the area around my Station. Final picture of the area around Gusindor's Station. This was the debut of Narbey's new squad. The Primary Attacker position was once again decided with a die roll. We only used one Single Shot Rocket per squad as I forgot to make any for the squad Occam's Spork was using and had to loan it one from my squad. The third and fourth turns really got chaotic. I could have gotten away with having full systems for my squad instead of underbidding. Let's finish out Ninjago week with a set was being given away as a birthday promotional at a Lego store near me. Bag. Brickset doesn't even have a MSRP, so I'm going to have to make one up. $3.99 sounds good, for a $0.09 Price per Piece. Parts. Once again, there's not a lot here. Plates, a couple of Wedge Plates, a Slope, a couple of Cheese Grater Slopes, a Bracket, a couple Boat Bumpers, several Clip Tiles, a 1x2 Mod. Brick w/2 Pins, a couple of 1x4 Mod. Bricks w/ Studs on side. We also have a couple of Stud Shooters, my first I believe, with an extra trigger. Score: +10 (A-). Not bad. Unfortunately, without a MSRP, we can't be sure of the score.